Many people are starting to grow their own food these days. There are a few reasons for this – it can work out much cheaper than buying supermarket fruit and veg, it enables them to eat fresher and tastier food and also, many people simply enjoy gardening and the pleasure that they get from growing their own food. You don’t even necessarily need an allotment or even a garden to start growing your own food – even a windowsill will do to get going with. Just because you live in a flat or a somewhere in a city centre doesn’t mean you can’t grow your own food. Herbs such as basil are great for growing on the windowsill. The conditions are also ideal for foods such as peppers, chillies, dwarf french beans and cress. As well as window sills don’t forget hanging baskets if you haven’t got a lot of space – they are great for growing tomatoes herbs and strawberries. If you’re lucky enough to have a garden or an allotment you can afford to be a bit more ambitious with your fruit, veg and herb gardening. You’ll need to decide where the best place is in your garden for planting crops. Most vegetables, for example, need at least four hours of sunlight per day, if not more. Therefore you’ll need to find a patch of garden that isn’t shaded by trees etc. To grow good crops you’ll need good, fertile soil. It may be that the soil in your garden isn’t currently up to standard but after a period of cultivation you can improve it. You can buy numerous products that will improve soil. Alternatively, you can buy a planter or grow bag and grow crops in these. You’ll need to work out what will realistically grow on your plot and what you’d actually like to grow. How long do the crops take to grow? How much work do they take? How regularly do they need watering? What are the ideal conditions? In what conditions will the plant not flourish? Follow planting and watering instructions for individual plants carefully. 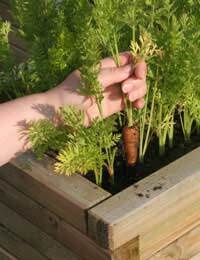 Dig a small hole about twice as large as the root space your plant will need (instructions will come with any seeds or can be found in gardening books or online). Drop the seeds in and fill. Different herbs, vegetables and fruits need different amounts of water. However, on average vegetables tend to need around one inch of water per week, which can be done once a week – first thing in the morning is the best time according to many gardening experts. The best way to get going with gardening is to borrow some books from the library or ask a green-fingered friend for advice. Then just dig in!